Discover six islands and caves on a full day speedboat cruise from Split. Board a RIB (rigid-inflatable boat), and visit beauty spots including the Blue Cave, Monk Seal Cave (weather permitting) and passing by Green Cave before stopping to swim, snorkel, and sunbathe at Budikovac Island’s Blue Lagoon. After a restaurant lunch, cruise to sandy beach Smokova bay in Vis island. 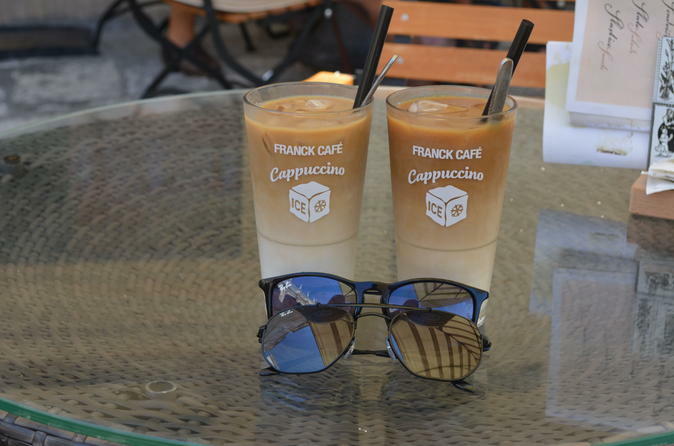 Continue to Hvar Town, enjoying free time here before a wine tasting on Brac Island. Lunch with wine and water, entrance fees to Blue Cave, and use of snorkeling equipment included. See the turquoise waters of the Blue Cave. If weather permits you will also visit Monk Seal Cave. Unlike other Blue Lagoon snorkeling trips, this excursion includes a restaurant lunch (and wine) in the cost. Meet your skipper and group of no more than 10 at Split waterfront, and board your RIB. Then, after a safety briefing, enjoy the views as you cruise into the Adriatic Sea. 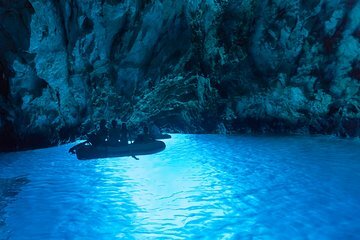 Cut through the waves on your speedboat, powered by a 300 horsepower engine, and head southwest to the Blue Cave on Bisevo Island. Watch for dolphins and sea turtles, and hear about the Adriatic coast, and its flora and fauna, from your skipper. After about 90 minutes, arrive and sail into the Blue Cave. Marvel at the piercing blue hues of the water caused by sunlight bouncing off the limestone bottom, and then check out other caves like the Monk Seal Cave. You will then pass by the Green Cave on Ravnik Island. The waters inside the cave are cast emerald due to the reflected sunlight. Next, cruise to the Blue Lagoon on Budikovac Island. Drop anchor in the turquoise shallows, and enjoy free time to go ashore or enjoy the waters. Take a swim or snorkel, laze on the beach, or stroll on the pretty island. Then, refuel with lunch at Budikovac’s only restaurant, savoring freshly prepared dishes of local ingredients before sailing on to sandy beach Smokova bay in Vis island. Continue your tour heading to Hvar Island. Dock at Hvar Town and get time to explore independently, perhaps visiting the medieval fortress or dipping into the shops and coffee houses along the pretty streets. Back aboard, make a last stop at Milna on Brac Island, and enjoy a wine tasting. Sample some delicious local wines and then dock back at Split, where your experience ends. Itinerary can be adjusted in case of adverse weather conditions. What an awesome adventure! The boat ride and the views were great but what really made the trip was the guides! THIS TOUR IS AMAZING! This was by far the highlight of my holiday in Croatia. There is not one part of this tour which is boring, even the boat is lots of fun as it's so quick. The longest you are on the boat for is about an hour and 15 minutes at the start but this passes quickly as it's such a thrill. The guides are brilliant - they're so much fun and know the areas well so know how to make the most of the time we have available on the day. They were also great at recommending places to go when we stopped on certain islands. The swimming stop is beautiful - the beach is amazing, the water is so clear and it was so quiet with few people there. Lunch was also really good too. Everyone in our group sat together and wine was supplied so it was a great way to socialise and get to know better the people we had spent the day with. I would 100 recommend this trip to anyone travelling to Split!! It was the highlight of our trip. My husband and I would recommend this 6 island tour to anyone. The guides were amazing and went above and beyond. Vanuit Nederland hebben we deze excursie geboekt en het was werkelijkwaar onze leukste, actiefste, meest sensationele, rijke, waardevolle ervaring in Kroatie. Peter en zijn crew hebben ons een mooie dag bezorgd. Elke stop was meer adembenemend als de vorige. De crew is zorgzaam, betrokken en ervaren. Alles is tot in de puntjes goed geregeld. De lunch wat gelijkstaat aan een diner op het prachtige eiland brac was heerlijk. Elke stop hebben we heerlijk kunnen zwemmen. En over de boot zelf, wat een speed, wat een toch. Peter en zijn crew dansten over de golven. Dit was het meest sensationele. Een dikke tien voor Peter en zijn crew. Jullie zijn toppers! Peter told us he works with his hart and all passion. We really saw this, he, his girlfriend and his crew! with passion they did it! they made it! This was one of our top experiences on our Europe trip. We left the dock on time and the RIB boats were very comfortable. It takes about an hour to boat out to the first stop which is the Blue Cave. They did a great job making sure it is our first stop as it gets incredibly busy. The Blue Cave you are maybe in for 5 minutes because of so much traffic but its a must see. You go to different islands you would never experience and get time as each of them. Our guides made it fun and you could tell they cared that we had a good time. Only change I would make is have a chicken option for lunch as it was limited to fish, bed or veggie. Also I would recommend to bring your own snacks so if you dont want the sandwich at the Bach you dont go hungry. Excellent tour! Great tour guides who know all of the sites very well. They kept us on time and safe, yet created a light hearted atmosphere that allowed everyone to relax and have fun. This was a great tour and gets you aquatinted with the islands so you can plan a visit back to whichever you choose. Great experience! WOW, WOW, WOW! An action packed day of adventures, great value! YESSS. Probably the most fun I had on my whole trip. Totally worth the price. The company is great, and the boat is a ton of fun. They get you to the Blue Cave early to beat the other tours. The wine tasting is just so-so but they give you a ton of wine at lunch so you're pretty drunk by then and don't really care. Hvar is amazing. The blue cave is amazing. Brac is amazing. A few suggestions for future tours: less time on Budikovac, which we called trash island. Also the restaurant wasn't that great. But who cares it was such a hoot. Best tour we took while in Croatia. The speedboat is the way to see the islands. Other similar tour options were a little cheaper but we say them out on the water and the boat they use is not nearly as cool. Mike was amazing and made the tour even more enjoyable. Would absolutely book this tour again. This tour does not disappoint!